New Delhi: The Indian Council of Medical Research has confirmed that fruit bats were the primary source of the Nipah outbreak in Kerala’s Kozhikode and Malappuram districts, where 17 people died due to the virus earlier this year. Initially, a central medical team had ruled out bats as the primary source of the infection after the samples collected from bats in two Kerala districts tested negative. Later, another medical team in its report to the Union health ministry said bats cannot be ruled out as the samples were collected from insectivorous bats, which are not known to be Nipah carriers. In the second round, samples from 55 fruit bats were collected and sent to National Institute of Virology in Pune. An ICMR official said the samples from fruit bats tested positive for the virus, confirming that they were the source of Nipah infection in Kozhikode and Malappuram districts. The natural host of the virus are fruit bats of the Pteropodidae family, Pteropus genus. Intermediate hosts of this instance were found to be pigs. The outbreak of Nipah virus was first reported in Kampung Sungai Nipah, Malaysia in 1998. 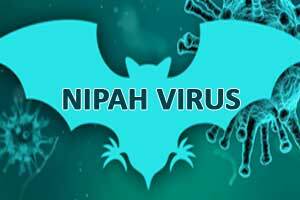 There is no vaccine or drug to treat Nipah infection. The primary treatment for human cases is intensive supportive care. According to the World Health Organisation, human infections range from asymptomatic infection, acute respiratory infection (mild, severe), and fatal encephalitis. Infected people initially develop influenza-like symptoms of fever, headache, myalgia (muscle pain), vomiting and sore throat. This can be followed by dizziness, drowsiness, altered consciousness, and neurological signs that indicate acute encephalitis. Some people can also experience acute respiratory distress. Encephalitis and seizures occur in severe cases, progressing to coma within 24-48 hours.